Type and Characteristics: Three-masted steam cutter (described as barque-rigged, but appears to be schooner-rigged from the image, above), built by Pusey & Jones Corp., Wilmington, DE at cost of $92,500, iron-hulled, commissioned 1871, 350 tons displacement, 163ft long x 25ft beam x 11ft 4in draft, vertical steam engine, armed with 4 guns, unknown type/calibre, crew of 45. Log Period and Areas of Service: 1871-1906, East coast of US, Alaskan waters, Spanish-American War service. 19 January 1872 - Assigned to New York area, commanded by Captain George R. Slicer. 1872-93 - Patrol duties on Atlantic coast from Block Island Sound to mouth of the Delaware River. 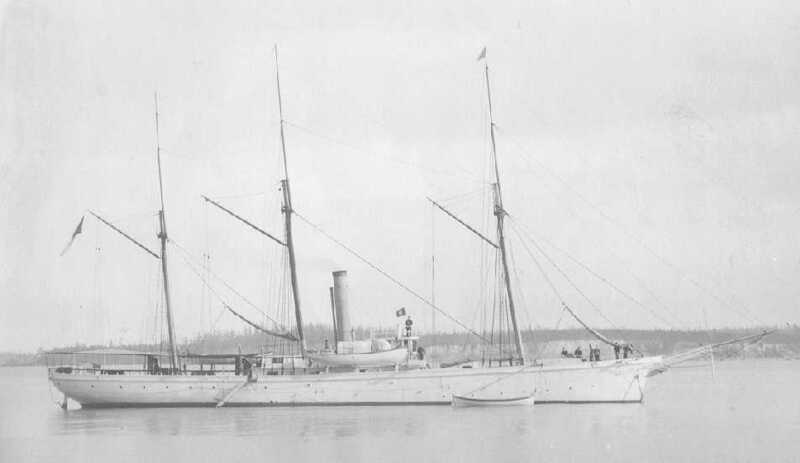 29 September 1893 - Withdrawn from East Coast for Pacific duties. On 6 December, sailed from New York for Port Townsend, Wa via Barbados, Bahia, Montevideo, Valparaiso, Callao, San Diego and San Francisco. 23 April 1894 - Arrived Port Townsend, her new home port. 1894-98 - On patrol, protecting salmon fisheries and assisting ships of the Bering Sea whaling fleet. 7 April 1898 - Arrived at San Francisco, placed under control of US Navy on 11th in time for the Spanish-American War. Returned to Treasury Department on 16 August, continuing same patrol duties off Washington and Alaska. 1902 - Searched for British man-of-war HMS Condor. 23 January 1906 - Pacific Mail Line SS Valencia carrying 164 people was stranded off Cape Beale Light, near Vancouver Island, British Columbia with only 38 survivors. Helped recover bodies and carry them to Seattle. In the Summer, she made her last cruise, patrolling salmon fisheries off Point Wallace, WA. Fate: 28 November 1906 - Sold for $16,300 to A A Cragin of Seattle as merchant ship Grant.